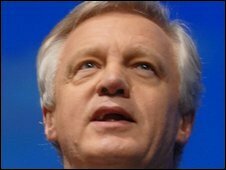 The government's handling of the ID cards scheme has been a "national embarrassment", the former shadow home secretary David Davis has said. Mr Davis said the project was "dying a death of a thousand cuts" after plans to make cards compulsory for some airport workers were dropped. But he complained the National Identity Register - for which he said there was "no need" - was still going ahead. Home Secretary Alan Johnson insisted ministers were committed to ID cards. On Tuesday, Mr Johnson announced that plans to make them compulsory for pilots and airside workers at Manchester and London City airports would be cancelled. Unions had campaigned vociferously against the trial. As a result of Mr Johnson's announcement, foreign nationals living and working in the UK will be the only group of people who will have to have the cards, with 50,000 already having been issued. The Tories and Lib Dems want the £5bn scheme scrapped altogether, while some Labour MPs have expressed doubts about its cost. Speaking on BBC Radio 4's Today programme, Mr Davis - a leading critic of the project - said the scheme was effectively finished in the wake of the home secretary's statement. But he queried why the proposed National Identity Register was still going ahead. 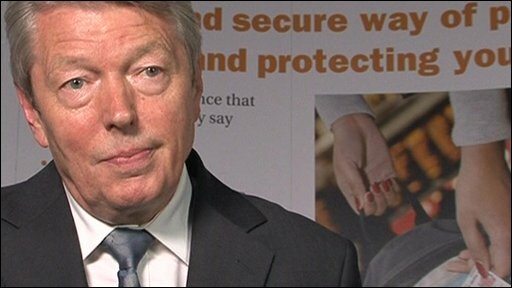 Alan Johnson: "I want ID cards to be voluntary"
As part of the regulations, a fine of up to £1,000 will be levied on those who fail to notify authorities of a change of address. Mr Davis added: "What's wrong is that the data is there in the first place. There is no need for a national identity register. "Why do you need to have a government ID card to get around in your normal life? Most of us get by fine without it." Announcing the shift in policy on Tuesday, Mr Johnson insisted he was committed to the scheme, which he said would would help stop illegal working, people trafficking and identity fraud. "Holding an identity card should be a personal choice for British citizens - just as it is now to obtain a passport," Mr Johnson said. Although ID cards were initially promoted as an anti-terror measure, Mr Johnson said they should not have been sold as the "panacea for tackling terrorism" which he said had been responsible for "messing up" the debate. He also said the national roll-out of the voluntary scheme was being speeded-up - with London to get them a year early in 2010 and over-75s to get free cards. In recent years, the government insisted it would not make them compulsory for UK citizens without giving MPs a vote on the issue - and it would not be compulsory to carry them. But it had been planned to make them compulsory for all 200,000 airside workers from 2009 but instead the government announced there would be an 18-month trial, for airside workers at Manchester and London City airports only. But the pilots union Balpa had complained that its members had effectively been forced into signing up for the cards. Liberal Democrat home affairs spokesman Chris Huhne said the proposed ID cards would now be "nothing more than a second-rate passport". "This is another nail in the coffin for the government's illiberal ID cards policy, which will soon be so voluntary that only Home Office mandarins seeking promotion will have them," Mr Huhne added. "These expensive and intrusive plans should be ditched now." However, in a statement, the campaign group No2ID said the "humiliating climbdown" was not the end of the scheme. "It's just part of the ongoing attempt by senior Home Office officials to fortify the scheme against cancellation and to bind the hands of a future government," the statement added. The rollout of the ID card scheme will be accelerated on a voluntary basis for UK citizens, starting in Greater Manchester by the end of the year. Residents in other locations in the North West of England will be able to apply from early 2010, while the government's intention is to roll out the scheme in London in the same year - 12 months early. Some 3,500 UK citizens have already applied for the cards. But the Tories - who say they will scrap the scheme if they win the next general election - have written to five firms bidding to supply ID cards warning them not to sign any long-term contracts. Political bloggers have been analysing what Alan Johnson's announcement to change ID card plans means for Labour and Alan Johnson. The only bit of sense that Johnson talked was when he admitted that the cards could probably be replicated by anyone skilled enough to do it. This admission makes the whole scheme utterly, utterly pointless as the whole point of the ID card is that its guaranteed uniqueness proves the identity of the holder. The announcement yesterday that they've cancelled any plans to make ID cards compulsory was welcome for one reason: It means the tide of public opinion is against them [Labour]. This isn't the end of the war against the New Labour's authoritarian grip on Britain, but it's certainly victory in a major battle. However on a slight tangent it is clear to see that Alan Johnson isn't going to let his stint at the Home Office be the graveyard everyone assumes it to be. In this one action he will win over a considerable amount of support. Following government waste of over £200 Million the new Home Secretary and probable future leader of the Labour Party Alan Johnson has announced a dramatic U-turn in policy by scrapping compulsory ID cards. The next U-turn we need from Brown is on his decision not to call an election. I think Johnson needs to go further if he wants to gain political capital out of this. Abandoning the Identity Database for UK citizens would score him real points, and by (for example) making it purely a register of non-UK citizens resident in the UK he could paint it as an immigration issue, with the Tories and Lib Dems on what I would expect to be the less popular side. However, as long as the Identity Database plans to contain all UK citizens' data, I think scrapping the ID cards themselves could be a move that is so half-hearted as to be detrimental to his chances of becoming Prime Minister.